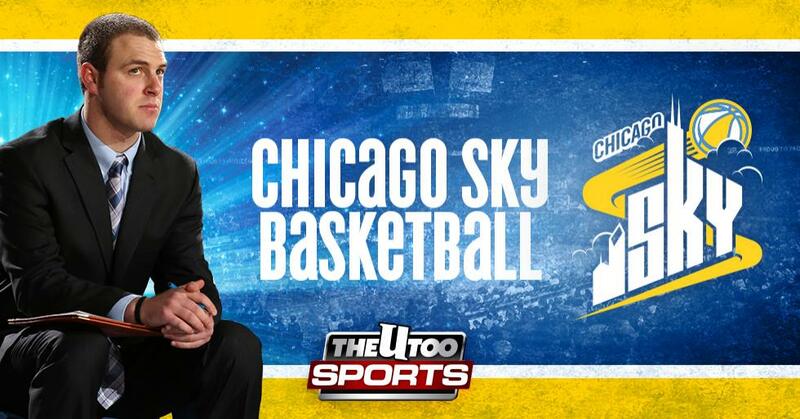 Chicago Sky Assistant Coach Jonah Herscu is destined for great things. Just four years into his professional coaching career, Herscu has already proven adept at scouting, video, player development and basketball strategy, and is currently balancing full-time jobs with both the Chicago Sky and the Fort Wayne Mad Ants of the NBA Development League. Herscu’s career trajectory seems destined to continue to trend upwards and he is just 24 years old. I ran into “Coach (which as any basketball aficionado knows becomes the replacement first name for anyone bestowed with the position) at practice, to ask him a few questions and to figure out how he got where he is, and where he thinks he’s going from here. This is my fourth year coaching. What motivated you to pursue coaching as your profession? Coaches I have had in the past. I had a really good AAU coach, and a couple other coaches along the way that I looked up to and they helped me a lot. That was probably the first thing that motivated me to want to be a coach. Also, I am a very competitive individual. I knew I was not going to play at the highest level. At a young age, I started taking things from coaches and reading about coaching. I enjoy studying the game. That’s a third thing, the strategy of the game. How did you get involved with the Sky? I had an internship with the Fort Wayne Mad Ants, the Pacers D-League team, and the guy I lived with and worked with closely did work with Craig Wolf, the head video guy [with the Sky] in 2011. He had worked with a guy I had worked with in Erie (Bayhawks) for a different D-League team. He connected me, and I got interviewed. The rest is history. Were you apprehensive going from men’s to women’s basketball? No, my senior year of high school I had an internship with the Amherst College women’s team; they are a very good Division-III team. I think they have won one national championship and gotten to two or three Final Fours. G.P Gromacki is the great coach there. So I worked with him, enjoyed my time there, learned a lot. So, for me, its basketball, can’t tell that much of a difference. During the 2015 season, you transitioned from the video department to player development to fill in for Tree Rollins during his leave of absence. What was that like? It’s tough; you never want to see something happen to such a good guy, like Tree. You don’t want to step on any toes, I learned a lot from him. He played 18 years in the NBA, has coached in the NBA, WNBA and D-league. We still talk now and then, no hard feelings of course. But you just try to do your role. We talk a lot about being a star in your role. Whatever that is for me, just try to do your job every day. During the 1982-83 NBA season, Tree blocked 4.3 shots per game. What are the most shots you ever blocked during your playing career? (Laughs) I’ll say 2, high school game. I am half the man Tree is, literally. When did you find out you were going to receive a larger coaching role with the Sky? I found out in December, 10th or 12th. I was working for the Mad Ants again. I was down in Indy, and the Pacers were playing the Warriors, I remember, it was a pretty memorable day. Pokey (Chatman) gave me a call and let me know. There were a lot of things that had to play themselves out. We had to wait and see with a couple things, I don’t think they announced it until maybe the start of training camp, but I knew since before the New Year. How do you think it’s going so far? What kind of new or unexpected challenges have you faced? I think it is going great, for me to be able to learn from Pokey and Christie (Sides) every day, it's like an individual coach’s clinic. You see how much work they put into it, which isn’t new for this year, it’s all four years of course. I think you see how much goes into and it really is the tip of the iceberg for the team. Today we were going over scout, there’s a lot of video that has gone into the decisions, lot of discussions, then you have to take into account your personnel, and how that plays into things. Everything we do is very multi-layered, which from the outside sometimes you think “oh that coach made that decision” and it's not just with Pokey, it’s the NBA, its football, it’s whatever you want to look at. You weigh a lot of different options, a lot of times a coach’s decision is trickier than it may appear. I also think there are no short cuts to success. It doesn’t matter that Pokey has gone to how many Final Fours (three, 2003-06 with LSU), and won championships overseas (2009-10 with Spartak), made it to the Finals (2014) in the WNBA. She comes to work every day. So I think that type of mindset, that you are always trying to get better, and you can’t take any days off, and you can’t skip steps, that stuck with me. What’s it like balancing jobs with both the Fort Wayne Mad Ants and the Sky? I love it, I’m 24 and I’m in the middle of my 8th season in professional basketball. Which is pretty remarkable, I don’t know anyone else who’s done that at 24. I’ve gotten lucky in terms of that, but it’s tough. I think I’ve had 6 totals days off each year the past 3 or 4 years. So, it becomes a lot, but when you love what you are doing. I never work a day in my life, but I work all the time. You do miss out on certain things. For the Sky I can’t watch as many college games, so helping prepare for the draft is tough. Even some offseason projects I’ve done in the past, just in Fort Wayne, there isn’t much time to do that. Vice versa I can’t go to summer league with the Pacers, which some of the other assistants and our head coach in Fort Wayne he’s on staff. You do miss out on certain things like that. The ability to be with a team for the season is so much valuable than anything I am missing out on in either offseason. I talk to Pokey a lot in the winter and I talk to Steve Gansey and our GM Brian Levy a decent amount. We have our D-league minicamp in the beginning of May so I was able to go to that for two days. So you make due and both organizations have been very understanding. That has been a blessing. What’s your eventual career goal? I think the short term is to keep learning every day. I am much more process oriented than outcome oriented. The outcome goal for me is to be a head coach in the NBA by the time I am 40, which is crazy, and I think that’s very ambitious, but you need to be ambitious in this business. I think if I continue that process of learning every day and coaching under some very good coaches, anything is possible I would say head coach in the NBA is my goal, but I also thought I would never be working in the WNBA. I have loved every season, all 4 seasons, so I’ll never rule anything out. Jonah Herscu has put in the work for eight years to prove to himself, and everyone else, that he’s a bona fide basketball coach at any level. And after everything he’s accomplished, in so little time, it’s fair to say that at just 24 years old, he’s already there. So a few years down the line, if you turn on your television set, or come to an arena, and see “Coach” stalking the sidelines, clipboard in hands, drawing up a play, just know where he came from. Jonah Herscu continues to learn, and his potential is Sky high.